Back to school time usually makes parents jump for joy. 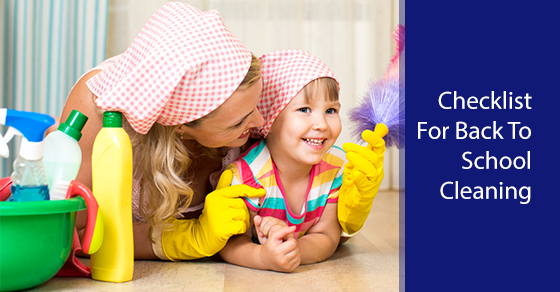 It’s a time when kids are out of the house, so you have time to give your home a good cleaning, without your munchkins under foot. To make cleaning organized and efficient, here is a checklist you might want to use before getting out the mop and bucket. Go through your things and get rid of items you don’t need or use anymore. Sell them at a garage sale, give them to friends who could use them, or donate them to charity. Every home has some of these items. Keeping a house clean is easier when clutter is non-existent. Let your children help out in their own rooms. Giving them choices as to how they would like to organize their stuff may entice them to keep their spaces relatively clean. Make sure everything they need in the morning is at the ready, so there’s no excuse for being late. School means backpacks, lunch packs, sports gear, and new shoes need places to be stored. Making space in your mudroom and coat closet will give these things a place where they can always be easily found. Give the countertops in your kitchen a good scrub. Do the same for your microwave and oven, there may be residue from too many pizzas and pizza pops. Clean out the fridge and get rid of any old items that are past their due dates. Scrub out the washer with vinegar water and wipe out your dryer drum. If you don’t enjoy cleaning appliances, then you may want to hire someone for a one time house cleaning. Now is the time to give your carpets and tiles a good cleaning, to rid them of the dirt and grime your kids have tracked in all summer. If this is something you really would rather not do yourself, call a service for a one time house cleaning, and ask if they would include carpet and floor steam cleaning. Using mats at entranceways will reduce the amount of dust and dirt that’s tracked into your home. Make sure to give them a good shaking out and vacuuming every so often. Place a shoe rack beside the mat, and insist your family members leave their shoes at the door.